If you’ve got a little inventor who has a birthday coming up, we’ve got the perfect plan! What could make the party more memorable than a bunch of kids building not one, but SIX robots? 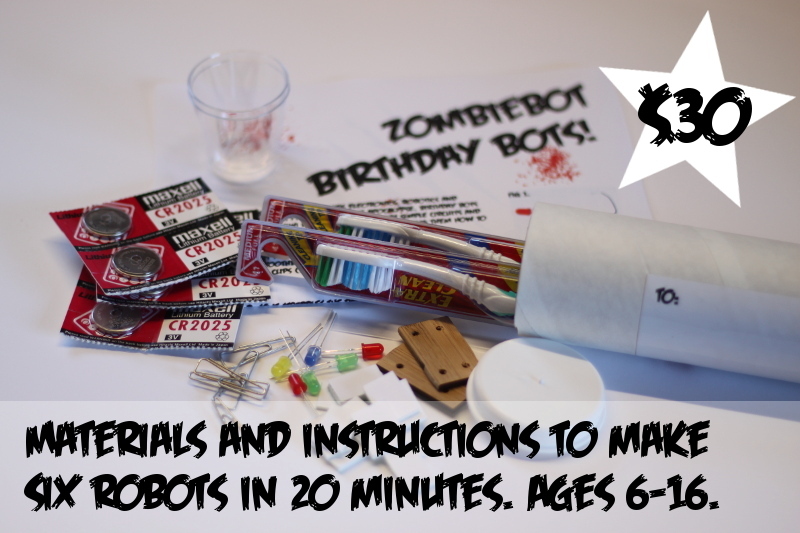 The ZombiebotHQ Birthday Bot kit gets delivered to your home and contains all of the components, materials and instructions to have kids aged 6-16 building two each of three different kinds of mini robots: a bristlebot, a vibrobot and a dalek. Once your inventors have built their robots, put them in the centre of a table and have a race to see who gets to the edge first. Hours of fun while you take time out from the birthday party madness to enjoy a cup of tea. No experience necessary- they’re a piece of cake to put together. So what exactly do the kids build? Email resistance@ZombiebotHQ.com and we’ll send you all the instructions. One quick internet banking transfer of $30, and email with the lucky kid’s name and address, and your robots will be in their way!